Typically, you can expect your Hoya plant to need watering once a week during the growing season in spring and summer, and then. only once every two weeks to once a month during fall and winter. This will vary depending on the size of your plant and the conditions it’s living in, so always check the consistency of your houseplant’s soil before adding more water to it. Like most houseplants, the Hoya plant is susceptible to root rot, so it’s always better to underwater than overwater it. 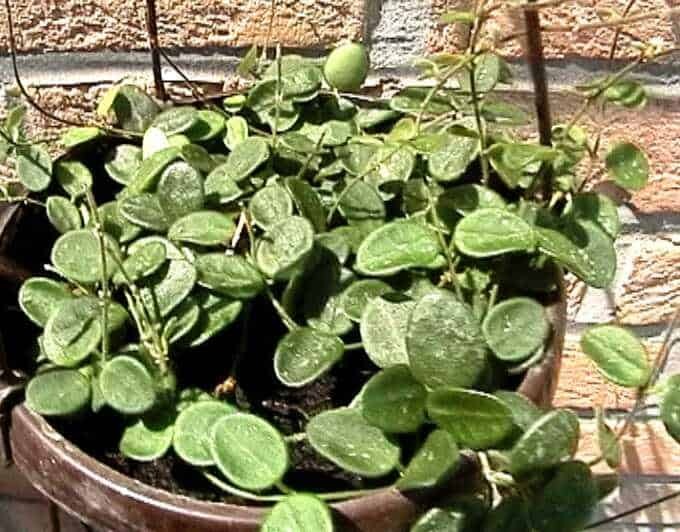 Although this plant is not a succulent, it does have quite fleshy leaves and can survive short periods of drought. The Hoya plant is an epiphyte, like the Orchid, so water it sparingly. This plant does not like to sit in wet soil, so only water it once the soil has had a chance to dry out, always checking the top few inches of the soil for moisture before you proceed with watering (Missouri Botanical Garden). Don’t water it too heavily, making sure that water doesn’t pool on the surface of the soil. In its natural habitat, the Hoya plant lives in low water conditions, so try to replicate this at home to get the best out of your plant. The Hoya plant enjoys bright indirect light. It will thrive in sunny spots where the light is filtered through sheer curtains. In fall and winter, the Hoya plant may live on a bright windowsill in direct sunlight, but it should be kept out of direct sunlight in spring and summer when the rays are stronger, especially in the heat of the afternoon, as this can cause the foliage to scorch or fade. If you want your Hoya plant to flower, then you need to position it in a spot where it will get as much bright, indirect light as possible, at least around six hours a day. If the plant isn’t getting enough light, then it will struggle to bloom. As a tropical plant, this plant can tolerate quite hot temperatures and is well suited to life indoors, where conditions tend to be warm. As a general rule, if you are comfortable with the temperature in your home, then your Hoya plant is comfortable too. 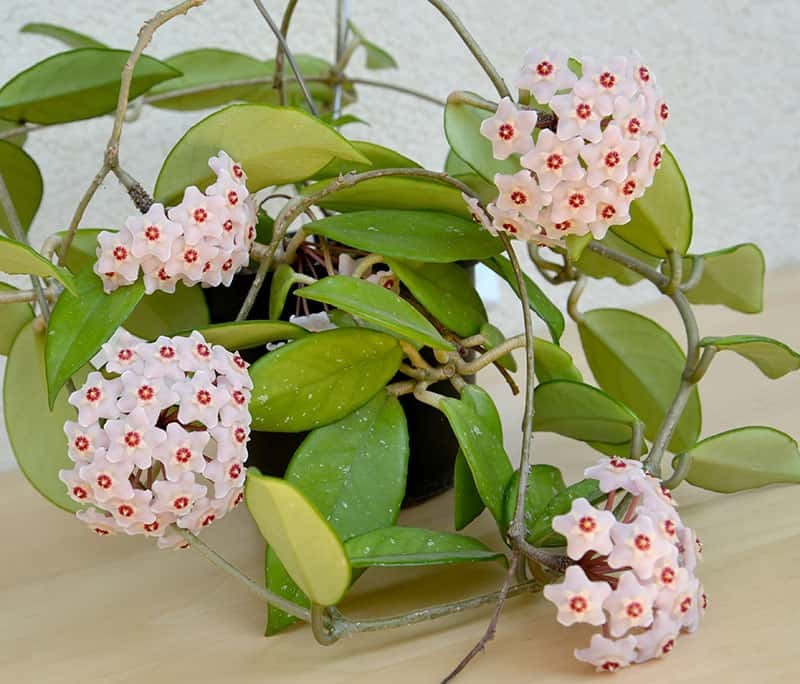 The ideal temperature will differ depending on the variety of Hoya plant, but most can cope just fine with temperatures ranging from 50° F to 95° F. The perfect temperature for most Hoya varieties is between 60° F and 70° F.
As a heat-loving plant, the Hoya does well in sunrooms and conservatories, as long as it is given some shade during the heat of the day. Don’t let your Hoya plant live in an unused area of your home, such as a spare room, where temperatures may drop too low during winter months if you don’t heat up that room. In conditions lower than 50° F, the Hoya plant will likely lose its leaves. Keep it away from cold drafts, such as near windows, doors, and air conditioning units, to prevent sudden changes in temperature. This plant does well in moderate to high humidity and should fare well in the normal humidity found in homes. Keep it away from heaters and anything that may dry it out. If you notice that your plant seems to be suffering as a result of dry air, you can increase the humidity around the plant. There are several ways you can do this, including using an electric humidifier. Other methods you can use are simply spraying the plant with a water mist every couple of days or placing it on a pebble tray filled with water (Gardeners World Magazine). If you use a pebble tray, make sure the plant’s pot with holes in the bottom are not coming into contact with the water in the tray, as this will make its roots too wet and soggy. The Hoya plant is quite independent and needs very little attention when it comes to pruning. If your Hoya plant has any dead, damaged, or diseased leaves, you can remove these to keep the plant looking its best. For anything over and above this, you should proceed with caution, as pruning too much or removing vital parts of the plant can have a detrimental effect. Flowers on the Hoya plant bloom on old flower stems called spurs (Royal Horticultural Society). It can be tempting to remove spent flower stems after the flowers have reached the end of their time, but in doing this, you will prevent the plant from blooming again in the future. Cutting back the trailing length of the plant will also have similar results. The plant needs space to grow in order for its roots to fill the pot and produce the much sought after flowers. While it may become essential to prune the plant if it becomes overgrown, do so in the knowledge that it could mean you’ll be waiting longer than usual for flowers to appear. Hoya plants, similarly to orchids, perform best when their pot is a snug fit, so don’t be too keen to repot your Hoya plant. Leaving it until it becomes root-bound will actually result in a better bloom of flowers, so you shouldn’t be repotting this plant very frequently. However, a time will come when the plant outgrows its pot and leaving it in such tight conditions can stunt its growth. At this point, it’s time to repot. If your Hoya is in a plastic pot, you can gently squeeze the sides of the pot to find out if it needs to be potted on. If there is give in the pot when you push the sides in, then the plant can remain in the pot. If the pot stays firm, then it means the roots are compacted and need some growing room. Repot the plant during spring by selecting a pot just one or two inches wider and deeper than the Hoya’s current pot. Using a pot that is too big for this plant can cause growth problems, as too much moisture in the new soil can overwhelm the roots and prevent flowering. Young Hoya plants will benefit from a fertilizer high in nitrogen throughout its growing period in the spring and summer. This will encourage foliage growth and should result in a lush and vibrant plant. Once the plant reaches a good size and you become more concerned with good flower production, you can switch to a different fertilizer high in phosphorus. 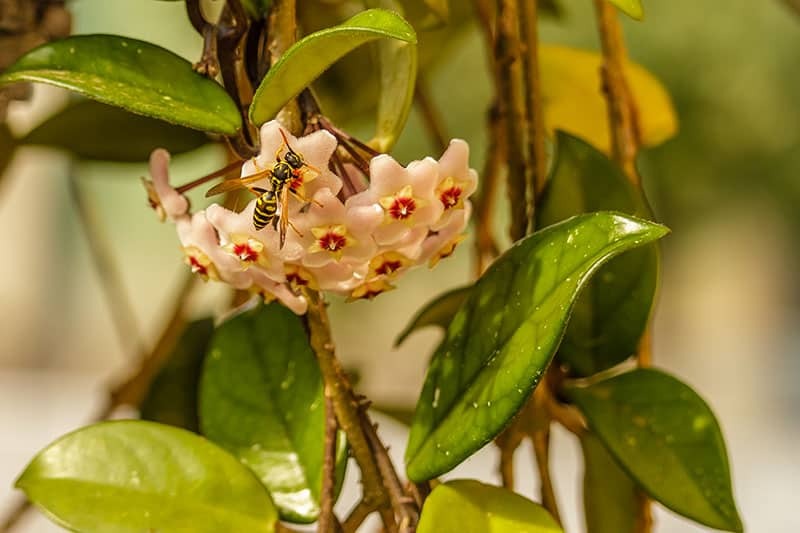 It is especially beneficial if you can give your Hoya plant a high phosphorus feed a month before it is expected to flower, as this should result in a spectacularly abundant bloom. Different types of Hoya plant bloom at different times, so you will need to know your plant’s pattern to be able to execute this. Hoya plants generally tend to do best with a liquid fertilizer, which should be diluted to half strength; this will protect your plant from fertilizer burn. During fall and winter, the plant becomes almost dormant and needs to rest, so you should not feed the plant during this time. Typically, propagation of the Hoya plant is performed with stem cuttings or layering, as these tend to be the most successful options. To propagate from a stem cutting, choose a softwood stem on the mother plant and cut it off with a sharp, clean tool at an angle. The angle gives more surface area from which roots can grow. The stem should ideally be about four inches long with a few sets of leaves on it and at least one node. Remove all of the leaves except for the top set. At this point, you can either use water to propagate your stem cutting or a moist propagation mix; both are equally effective, so it’s up to personal preference. You can dip the cut end of your stem in rooting hormone to encourage growth, though this isn’t essential. If you propagate in water, make sure that half of the stem is submerged, and half is sticking out. Situate it in bright but indirect light with plenty of warmth, preferably from the bottom. Change the water when it becomes cloudy. New roots will appear within several weeks, at which point you can remove the cutting from the water and pot it up in a small container with well-draining soil mix, continuing care as usual for a Hoya plant and watch as it grows into a new full-sized plant. Propagating in water is particularly interesting as you can watch the roots appear and grow, and you can obviously see when enough roots have formed to be able to plant it into a new home. However, propagating in a growth medium is equally successful and popular. To do this, select a mix specially formulated for propagation; a succulent mix often works well for Hoya plants. Fill a small pot with the propagation medium and ensure it is moist but not wet. Using your little finger or the blunt end of a pencil, make a hole in the center, which your stem cutting can stand up in. Keep the cutting in bright but indirect light in a warm environment. Although you won’t be able to see roots forming, you can check after a few weeks by gently tugging on the stem. If it comes right out, then it is not ready to be potted up, but if there is some resistance then, it means enough roots have grown to be able to place it into a more permanent pot. Another effective propagation method is layering, which should not be confused with air layering as the two methods are very different. To propagate with layering, select a long softwood stem on your Hoya and pin it down to a new pot filled with soil while it is still attached to the mother plant. Roots should begin to form along the side of the stem where it meets the soil, though it can take longer than propagating with stem cuttings. Once enough roots have formed along the stem, you can cut it free from the mother plant and allow it to grow into a new Hoya in its own right. 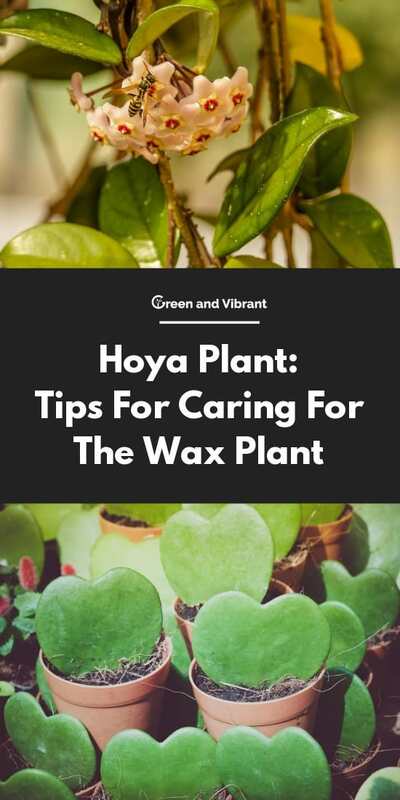 Leaf cuttings and seeds can also be used to propagate from the Hoya plant, but these are usually much less successful and more time-consuming. 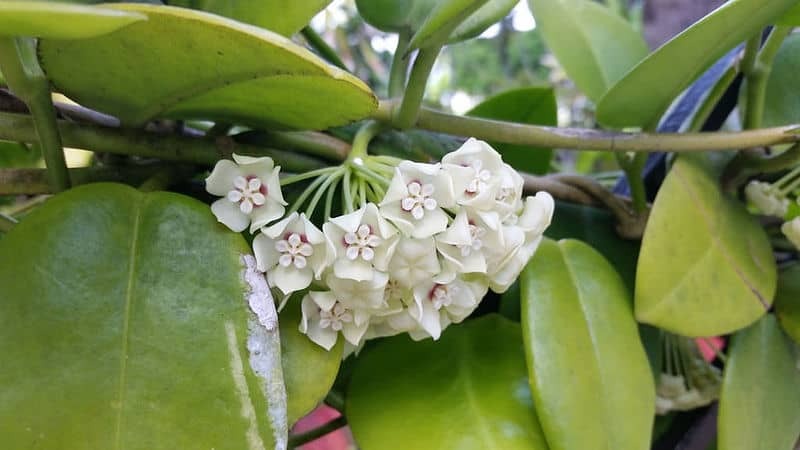 Hoya seeds are not stable, so you won’t know which type of Hoya you are going to end up with when you plant them, and many of the seeds are usually not viable, so you may have to plant many before you manage to successfully grow a Hoya plant. Propagating with leaf cuttings is similarly uncommon as it can take years before a leaf cutting develops into a plant. Though it is quite easy to get a leaf cutting to establish roots, it is much more difficult to convince the leaf to undergo any noticeable growth above soil level. The blooms on a Hoya plant are both beautiful and fragrant. 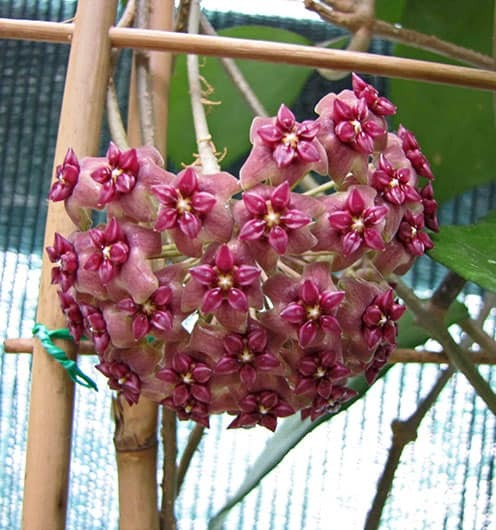 The star-shaped waxy flowers appear in various colors and sizes depending on the variety of Hoya. Some Hoya plants will bloom year after year, while others are more sporadic. There are certain types of Hoya plant, notably the variegated Hoya, which take several years to have their first set of flowers. Though the flowering of the Hoya can be inconsistent and unpredictable, these delightful blooms are worth the wait. To encourage flower growth, ensure your plant is getting enough light, is receiving an appropriate amount of high phosphorus fertilizer, and isn’t being heavily pruned. If these rules are applied, you should be in for an impressive display of flowers from your Hoya plant. It is estimated that there are several hundred varieties of the Hoya plant in existence, with more cultivars existing in some of the varieties. This means that there should easily be a variety of Hoya to suit everyone. Most varieties are grown for their flowers, though some are more of a vining plant, appreciated for their succulent foliage. You can also select your Hoya based on its needs, as different varieties like different climates, so you can find one that will grow perfectly in your home. A small snapshot of some of the varieties of Hoya plant is listed below. 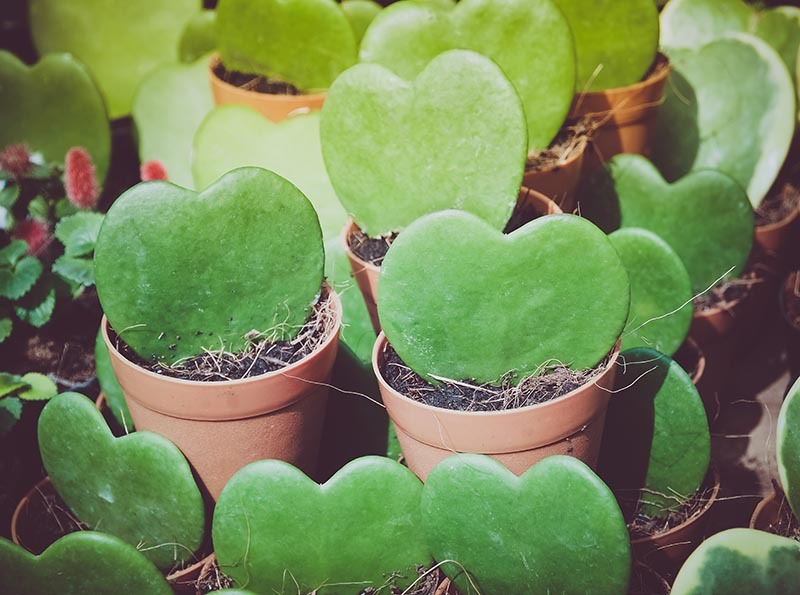 This variety of Hoya hails from Southeast Asia and is commonly known as the Sweetheart plant due to its heart-shaped leaves. As a houseplant, it is popular in Asia and Europe, making a regular appearance in garden centers and stores around Valentine’s Day each year. The flowers on this variety vary from yellow to light pink, with the central ‘star’ of each flower being a deep pink. This fast-growing vine can develop rapidly and will need plenty of room to grow. Native to Australia, this variety is one of the few Hoyas that worships the sun and can tolerate it directly all year round. It grows in the wild around the edge of rainforests and is known for its ability to attract butterflies. As a houseplant, this is most commonly seen in Australia, though it is starting to be brought to other parts of the world. With its juicy succulent-like foliage and white and pink flowers, it is a very attractive Hoya. This award-winning plant is what most people bring to mind when they think of Hoya. It is the most popular and most commonly found variety of Hoya, native to Australia and Eastern Asia. Many cultivars of this variety exist, all of them producing waxy leaves and star-shaped flowers in an array of colors. The stand out element of this variety is the fragrant blooms, which smell especially sweet in the evening. This variety of Hoya, native to the Himalayas, produces unusual-looking flowers. Though its blooms are the typical star shape associated with Hoya plants, they have a fuzzy, almost bristle-like texture and seem to be a cross between a flower and a nettle. The blooms are always a very pale green, with the central star being white or cream. The only vibrant color on this variety is a small spot of pink found at the middle of each flower. While the flowers on this variety may be somewhat underwhelming, the foliage is lush and abundant. The waxy green leaves of this Hoya plant are round in shape and grow rapidly along the extending vines. This plant has been named cinnamomifolia due to the similarity between its leaves and those of the Ceylon cinnamon plant. It originates from Java, an Indonesian island. This variety is rarely grown as a houseplant, which is a shame because its blooms are very intriguing. The outer part of the flowers are usually a pale green or yellow, while the central star-shaped part of the flower is a very deep and rich shade of pink or red. What’s your favorite variety of Hoya? Let us know in the comments and share this page with other Hoya lovers!